Are you looking for shirts with fun inks? You have come to the right place! Broken Arrow specializes in shirts with fun inks and offers tons of options for screen printing, embroidery, and even rhinestones to jazz up your design! We also offer mixed media printing, so you can have a screen printing design with rhinestones added. Or, go with a screen printed design and have parts of the design embroidered. The choice is yours! There are so many options for shirts with fun inks at Broken Arrow! Browse our huge assortment of specialty inks for your shirts with fun inks! Add some sophisticated class with a metallic ink, or go for a fun, funky look with cork or suede ink. Other popular choices for shirts with fun inks include foil, high density, and super clear gel. There are so many amazing options, it can be hard to choose your favorites! Order our sample pack online and you'll get a swatch of each specialty ink so you can see and feel all of them, and choose your favorites! 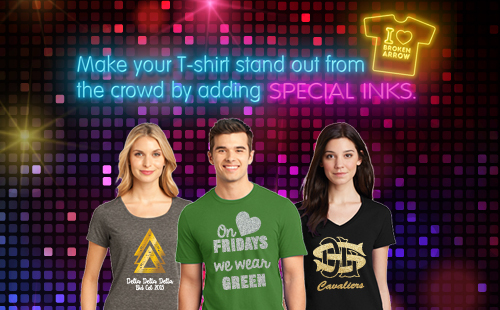 Enjoy free custom design services by our team of in-house artists for your shirts with fun inks! Whether you have a logo or just an idea, our artists can create a unique, custom design just for your apparel order. No boring stock designs here! All of our artwork is custom! You'll get an online proof to review and approve within 1-2 business days after placing your order. The online proof shows the ink colors, dimensions, etc so you can be sure everything is 100% perfect! Be sure to visit our online catalog to see tons of great apparel options! We carry all of the popular brands like Hanes, Sport-Tek, Champion, Nike, Adidas, Next Level, American Apparel and many more! Get instant price quotes right online 24/7!